While most Americans disapprove of Donald Trump’s recent executive order that would prohibit refugees and travel from some Muslim-majority countries, a recent Pew Research Center survey finds a sizable divide on the issue among the country’s major religious groups. Most Republicans support and most Democrats oppose the order, which would temporarily prohibit accepting new refugees from Syria into the U.S. and also prevent people (refugee or otherwise) from seven Muslim-majority countries from entering the U.S. The partisan gap is mirrored by a religious one. About three-quarters of white evangelical Protestants (76%), most of whom identify with or lean toward the GOP, say they approve of the travel ban. In stark contrast, big majorities of black Protestants (84%) and religious “nones” (74%) – two strongly Democratic constituencies – disapprove of the executive order. Most Catholics (62%) also disapprove of Trump’s action on this issue. But among Catholics, there are big differences in opinion between whites, who are evenly divided in their view about the order, and Hispanics and other racial and ethnic minorities, who overwhelmingly disapprove of the restrictions on refugees and travel. White mainline Protestants also are divided on the issue. 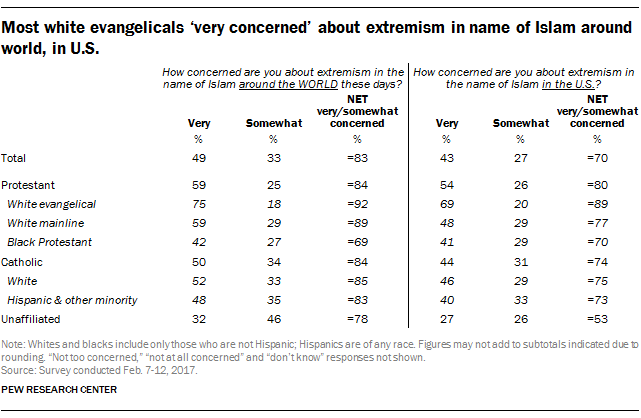 In addition to approving of new restrictions on refugees and travelers from Muslim-majority countries, three-quarters of white evangelical Protestants also say they are “very concerned” about extremism in the name of Islam around the world these days, and roughly seven-in-ten (69%) say they are “very concerned” about extremism in the name of Islam in the U.S. Roughly half or more white Catholics and white mainline Protestants share these sentiments. At the same time, roughly three-in-ten religious “nones” say they are “very concerned” about extremism in the name of Islam around the world (32%) or in the U.S. (27%). 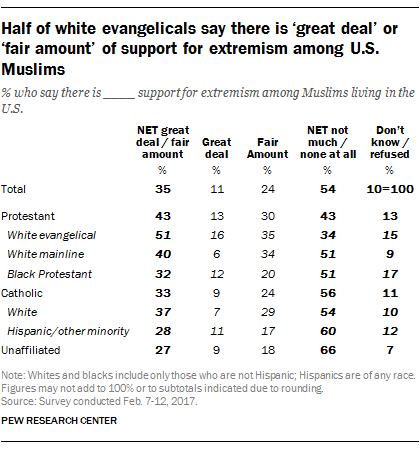 The survey also shows that about half of white evangelicals believe there is a “great deal” (16%) or a “fair amount” (35%) of support for extremism among Muslims in the U.S. This is a minority viewpoint in every other major religious group.